I have been using this pub for about 20 years, I can't imagine any of the bar staff trying to pull a stunt like that with a ready poured flat pint , the landlord would never allow it !!! at lunchtime if it was sunny. ever seen. When I said " can you pour another the barman said NO ! from the tap, she refused !! As a visitor to the UK I do my best to debunk myths of Australian behaviour & try to live to the rule of not saying anything if its not complimentary. But this pub tested me. A nice pint of Deuchars IPA, 3.55, and a pleasant if uncommunicative bar person were the good bits. A squarish room, tables & chairs, bog standard pub. But the customers! They all seemed related to each other and included small children who ran rampant indoors & out, perhaps obeying my silent plea to go play in the traffic. Parental control was non existent, then volcanic, and peace only came when electronic pacifiers were issued. I necked the pint & left quickly. Life is too short, and good pubs too plentiful, to dwell on the occasional bad apple. shall never frequent this establishment again. Rudest, untrained, uneducated bar staff I have ever born witness to. I was having a quiet drink in here last night, just going along minding my own business. I have been coming here after work for a quick couple of pints for the past two and a half years. 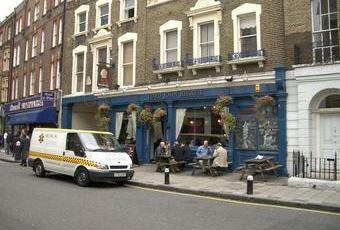 The beer has always been in truly excellent condition and the place including the toilets are kept in a clean fashion. However, the bar man last night was extremely stroppy and rude, f-wording this under his breath and c-word this clearly aimed at a group of men who were quietly having a few drinks at a table. It appears because they only purchased one bottle of wine and several half pints of something in perhaps the hour they were there the barman loudly went over to them and told them to leave as they were taking up a table. Taking up a table? The place was hardly busy and there were many empty tables! One of the chaps came up to the bar and asked for the manager. If the man who appeared was the manager then that is surprising as his torrent of abuse was just as rude as the barman. I have never ever witnessed such outrageous and disgusting behaviour aimed towards a paying patron in any establishment. petulant and contemptuous people a lesson. I for one will never return and I shall be certain to spread the word among my work colleagues who occasionally frequent this place.